Nick Clegg was unknown to me when I posted Astrology of the UK election. Now we want to see his horoscope, because three weeks into the campaign he is giving the two major parties something extra to worry about. We don’t have his birth time yet, but we can still see why he is doing so well in the polls by looking at the major aspects in his horoscope. The major astrological influence his chart brings to this whole election debate involves the tight configuration between Saturn, Uranus, and Neptune. In the previous article on this topic I said of David Cameron, “he does have transiting Jupiter conjunct Saturn which suggests good luck with taking on more responsibility, and the last Solar Eclipse was sextile his Saturn. Natally he has Saturn opposite Uranus so the current Saturn Uranus opposition may work well for him even though it makes no aspects to his chart.” This is exactly what Nick Clegg has because they were born only three months apart. However this is so more intense in Nick Clegg’s chart, his Saturn Uranus opposition is almost exact, while David’s is about three degrees away. The current Saturn Uranus opposition can be seen as the struggle between the old and the new. I have mentioned before that this can represent conservative Tory versus progressive Labor. The rise of the Liberal Democrats with Nick Clegg has changed this equation now. British voters view both Tory and Labor as stale old fashioned politics (Saturn). Their policies are not that different and people are looking for something Uranian, original and fresh to upset the status quo. Not only is Nick born just hours after a Saturn Uranus opposition, the central pole of a Kite aspect pattern. He has the fortune of being able to bridge these opposing forces with dreams and visions from Neptune. You can see in the chart above that Neptune is trine Saturn and sextile Uranus, both within one degree. I would expect this is the major astrological reason that he is doing so well during this time. I do agree with Claire Chandler that “it’s difficult to find an astrological justification for anything spectacular happening to Clegg from this untimed chart.” Especially with the difficult natal aspects to Sun and Venus. I’m still sticking with my prediction that the looser in this election will be Gordon Brown. What Nick Glegg and David Cameron share is Saturn. Transiting Jupiter is conjunct both their Saturn’s on election day so there may be a shared responsibility. The New Moon at 24 Aries has made a transiting Yod in Nick’s chart, quincunx Uranus and quincunx Neptune. A special task during this time frame which is above the personal. The planets past Saturn relate to the mass consciousness, the voters tuning into his message of the bigger picture. We have a birthtime for Nick Clegg. IF this time is correct then I’ll say we have a winner here! I have put the new chart for 5:30 am in the post above. God, i am getting old! Nick Clegg is 13 days younger than me and david cameron is only 3 and a half months older so hopefully it will be a good year for goats or at least those of us born in the year of the horse! 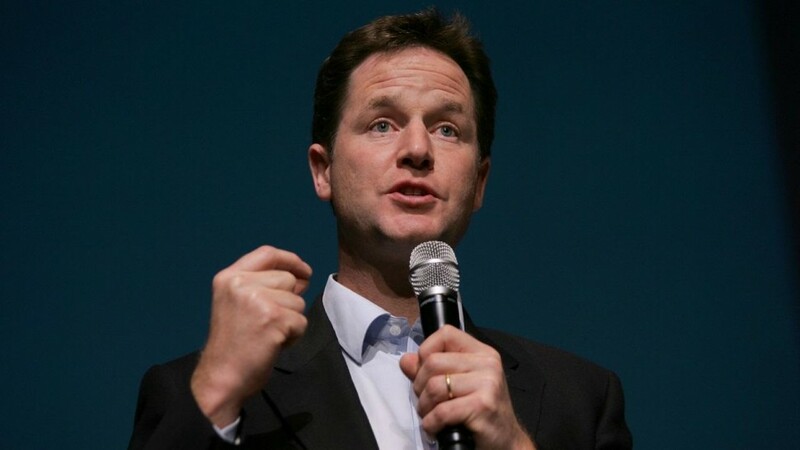 I love the Sabian symbol for Nick Clegg’s ascendant – “A Golden Haired Goddess of Opportunity”. And the Moon is in the degree of “Two Men Playing Chess”. Without doubt that’s the right birthtime!